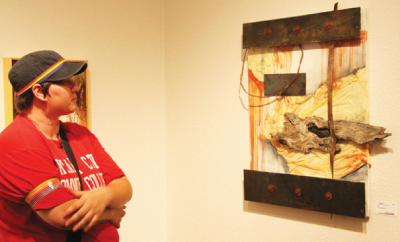 Camryon DeCarlo, film and video editing major, admires “Elements I” by Laine Godsey. “Elements I” was created from acrylic, metal, oil, paper and wood. The OCCC Art Gallery, located in the Visual and Performing Arts Center, is hosting the 2010 Mixed Media Collage Juried Exhibition.The Exhibition showcases local artists who use mixed media. Admission is free and runs from 11 a.m. to 6 p.m. Monday through Friday and 10 a.m to 2 p.m. Saturday through July 22. Mixed media is any type of art, sculpture, or canvas that uses two or more types of materials such as wood and string, Oklahoma Watermedia Association Vice President Janice Mathews-Gordon said. “Because the exhibition is juried, the art that is on display is the best of what was entered,” Mathews-Gordon said. The artwork was judged June 9. The exhibition features 50 pieces of art by 31 local artists. The media used to compose the art vary from wood and metal to thread and paper maché. “It’s really great to have so many interesting pieces of art here at OCCC,” said curator Michael McMillian. Some of the different types of art include baskets, sculptures, and canvases. The baskets are made of paper and thread and also wire and fabric. Other mixed media pieces are composed of metal, wood, canvas, newsprint, and string, Mathews-Gordon said. “Haberdasher” by Corazon S. Watkins from Norman won the Best of Show award, which was given at the exhibition opening June 18. But all the pieces in the show offer something unique, Mathews-Gordon said. For more information or to purchase a piece of art, e-mail Janice Mathews-Gordon at art@mathews-gordon.com or call 405-848-8883.